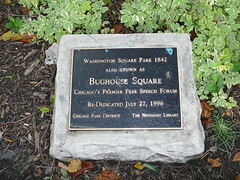 Over at my old stomping grounds, the Newberry Library will be hosting its annual Bughouse Square Debates on July 26, 2008. If you’re in Chicago you should plan to be there. Each year the library closes off Walton Street and reconnects with Washington Square Park’s legacy as one of the nation’s premier outdoor open forums. They set up four soapboxes in the park, and speakers from various political positions (mostly left of center) hold forth. I have a fond memory of a big turnout by the group Critical Mass with their proposal to “depave” Lake Shore Drive. Don’t know if there was any real connection, but I’ve always associated that proposal with the whispers of “take the Drive, take the Drive” at the big 2003 antiwar march that “spontaneously” took over Lake Shore Drive in the middle of rush hour. I am way out West now, but I wanted to do my part to support the event. I have a few folders of interesting documents from the colorful past of Chicago’s outdoor and indoor open forums including Washington Square Park (a.k.a., Bughouse Square), Washington Park (the Bug Club), and of course the infamous Dill Pickle Club. So in the interests of education, I’ll offer them here for you, dear readers. Mostly unedited. The copyright issues may be a little foggy at times, so I also offer a blanket reminder that anything posted here is for educational purposes only. This entry was posted in Document, History and tagged free speech, Newberry Library. Bookmark the permalink.